That idea you've had tumbling around in your mind has finally reached the next phase of the ideation process. Those broad conceptual abstracts have been filled up with specific details of actions that will allow you to move forward. This is where paralysis attacks creative leaders. The idea must advance into the public domain, but for some reason it seldom does. Why are we constrained to stop the process before "going public" with it? I'm convinced it's because we, in large measure, hold a distorted view of failing. 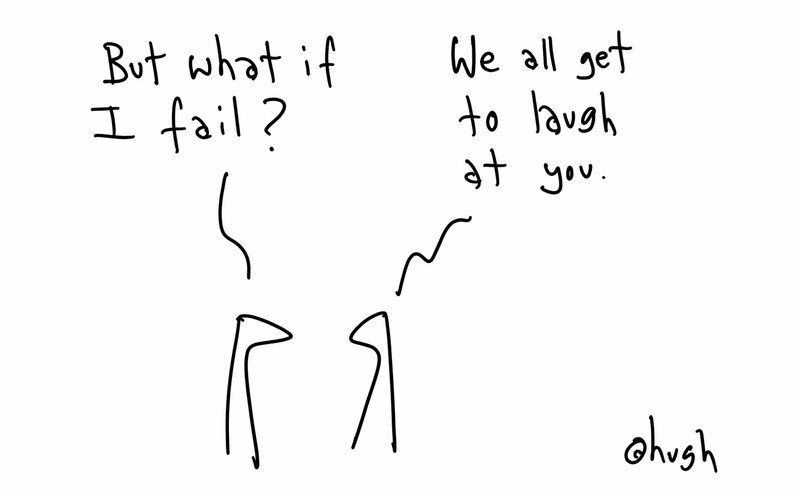 We imagine the ridicule we'll face if our endeavor doesn't take off. We get caught by what Steven Pressfield calls "The Resistance" or what Seth Godin calls "The Lizard Brain." When we take an idea, event, product, service, or whatever to the stage mentioned above (from broad to specific), then the fear of failing intrudes and convinces us that if we pitch it and it fails (according to whatever subjective metrics you're using to measure success) we will lose all our credibility and we've reached the end our ability to create any sort of positive change. Failing is an opportunity afforded only to those who step out boldly, embrace the risk of being misunderstood or criticized, and thus reap the rewards of knowing more about what doesn't work and why. In light of this, we must shift our opinions of failure! We must begin to see failing as a potential blessing and not just a curse. 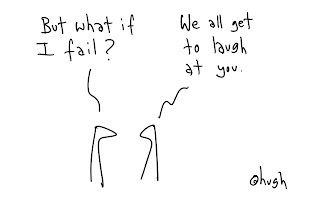 Failing is actually an integral part of life in leadership. This was the perspective that allowed Thomas Edison, the prolific American inventor, to say, "Every wrong attempt discarded is another step forward." Failing to accomplish something you sought to accomplish does NOT make you a failure. A failure is one who no longer seeks to advance positive ideas, causes, events, services, etc. In other words, then, a failure is what one can become if he/she fails to see the blessing of failing. Is there an idea that you've been mulling over, but have been too afraid of critique and failing to actually share it with others? It's time to go for it! The 19th century Christian philosopher, Soren Kierkegaard, said, "If I have ventured wrongly, well, then life helps me by punishing me. But if I have not ventured at all, who helps me then? Moreover, what if by not venturing at all in the highest sense (and to venture  in the highest sense is precisely to become aware of oneself) I cowardly gain all earthly advantages - and lose myself" (The Sickness Unto Death, 32-33).